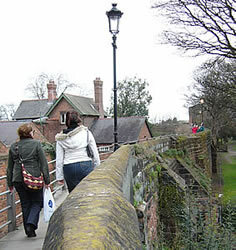 Chester (population: 120,000) is a city in the English county of Cheshire, near the border with North Wales. Established in Roman times, it used to have a port and in medieval times it was a wealthy trading centre. 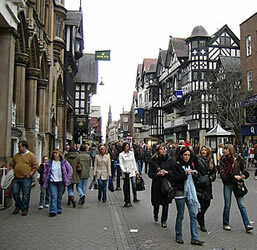 It is a popular place for shopping, especially in the part known as The Rows. This is a series of medieval covered walkways with shops on two levels. 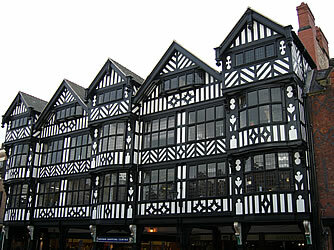 The Rows are in the centre of the old town, around four roads: Eastgate Street, Watergate Street, Bridge Street and Northgate Street. 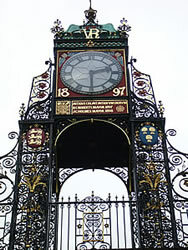 One of Chester's best-known landmarks is the Eastgate Clock. This was put up to celebrate Queen Victoria's diamond jubilee in 1897 (60 years after she became queen in 1837). The Cross stands in the city centre, near the junction of Eastgate Street and Bridge Street. This is the place where the Town Crier made announcements, a tradition which is still being followed today. 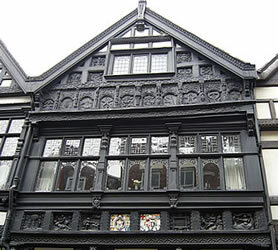 Bishop Lloyd's House used to be the home of the Bishop of Chester in the early 17th century. 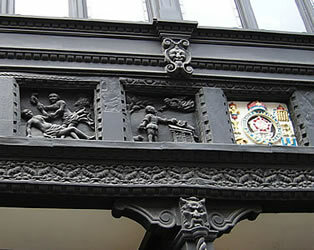 On the front of the building there are detailed carvings showing scenes from the Bible, coats of arms and animals. 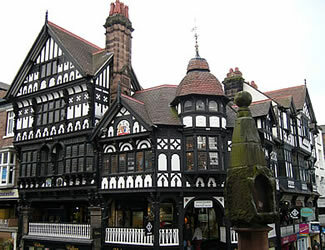 In 1647 plague struck Chester. Many died, but the people in one house in Watergate Street were not affected by the disease. 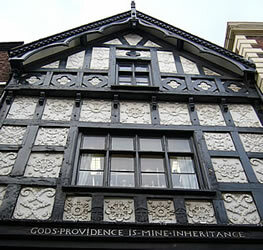 For this reason it is known as God's Providence House. Bridge Street is the road leading to the Old Dee Bridge, which used to be the main route from here to Wales. The shops of The Rows continue on both sides of the street. 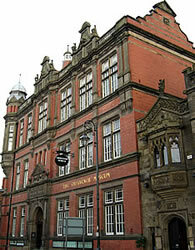 The town hall (opened in 1869) is located in Northgate Street. 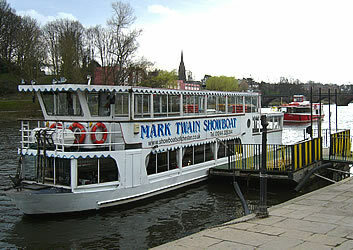 This is the location of the Tourist Information Centre, the starting point for most of the walking tours. There is a market in the Forum Shopping Centre. 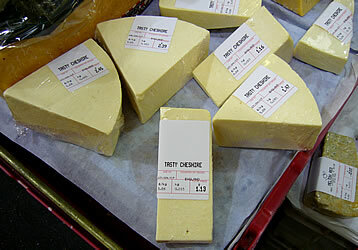 One of the products which can be bought here is Cheshire cheese. The Cheshire region includes a lot of agricultural land. 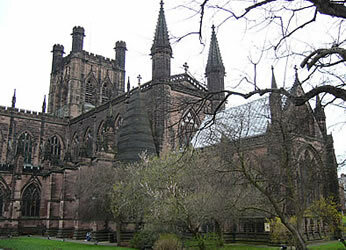 Chester Cathedral was a medieval abbey church before becoming a cathedral in 1541. It was restored in the middle of the 19th century. There is an entrance charge for visitors (except those who are attending a service). There are attractive views of the cathedral from the walls which surround the city centre. 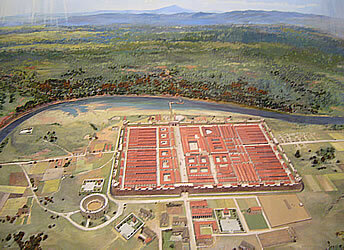 In Roman times Chester was known as Castra Deva (prounced Dewa), meaning "the military camp on the River Dee" (places in England whose names contain the letters "chester", or which end in -cester or -caster, were locations for Roman military camps). The 20th legion (about 5,000 soldiers) was based here for about 200 years. 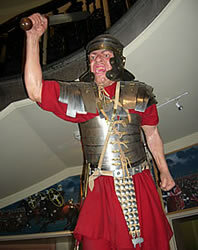 There were three permanent legionary bases in Britain: at Chester, Caerleon (in South Wales) and York. The remains of a Roman amphitheatre were excavated in the 1960s and can be seen opposite the Chester Visitor Centre (on Vicar's Lane). This was built in about AD 100. 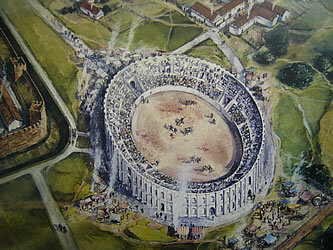 Up to 7,000 people could gather here to watch performances in the circular arena. 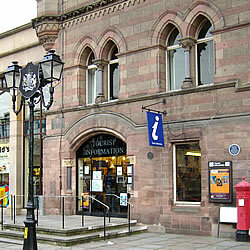 The Grosvenor Museum (on Grosvenor Street, free entry) introduces Chester's past, including its Roman history. Dewa Roman Experience (in Pierpoint Lane, off Bridge Street) is a museum about life in Chester's Roman fortress. The Normans built a castle at Chester soon after William the Conqueror took control of England. It was later used as a base from which to attack the Welsh. 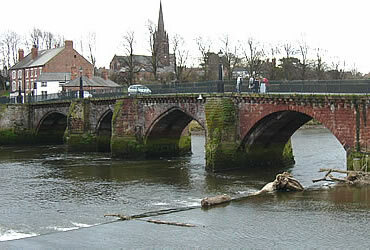 The current Chester Castle was rebuilt about 200 years ago, to be used as an administrative centre rather than for defence. 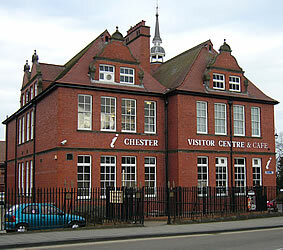 In one of its wings is the Cheshire Military Museum, which presents the history of Cheshire's soldiers. Only a few parts of the original stone castle remain. 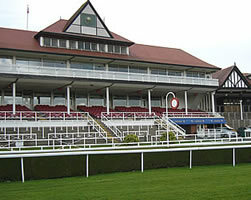 Chester racecourse (also known as the Roodee: "the island of the cross") is one of the oldest in Britain. 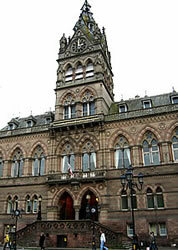 It is located to the south-west of the town centre, in the area that used to be the harbour. It is used for flat racing during the summer (from May until September). There are pleasant walks along the banks of the River Dee. During the summer months there are regular half-hour boat trips (starting from near the end of Souter's Lane, near the amphitheatre). 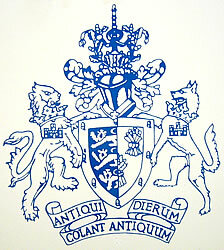 The Chelsea Regatta is an annual boat racing event on the river - this first took place in 1733. Chester Zoo is one of Britain's largest zoos, located north of the city. It has over 500 species and 7,000 animals. 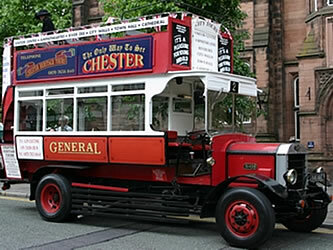 - Walking tours of Chester: contact the Tourist Information Centre or the Chester Visitor Centre for details. - By train it takes between 2 and 3 hours to travel to Chester from London's Euston station (it may be necessary to change at Crewe). For train timetables and to buy a ticket online, see: Shop/Company/TheTrainline. 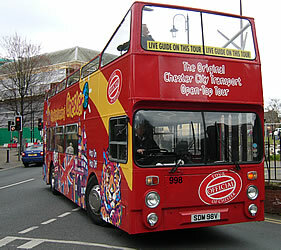 - Coach services usually take about 6 hours to Chester from London's Victoria Coach Station. 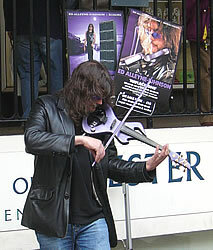 For timetables and to buy a ticket online, see: Shop/Company/NationalExpress.